NOTE: This result was originally announced on April 28, 2009 as an initial discovery and image release. A paper on the discovery is now available in the journal Nature: "Astronomy: A beacon from the cosmic Dark Ages (pp 1254-1257; 1258-1260; N&V)"
Distribution of redshifts and corresponding age of the Universe forgamma-ray bursts detected by NASA's Swift satellite. 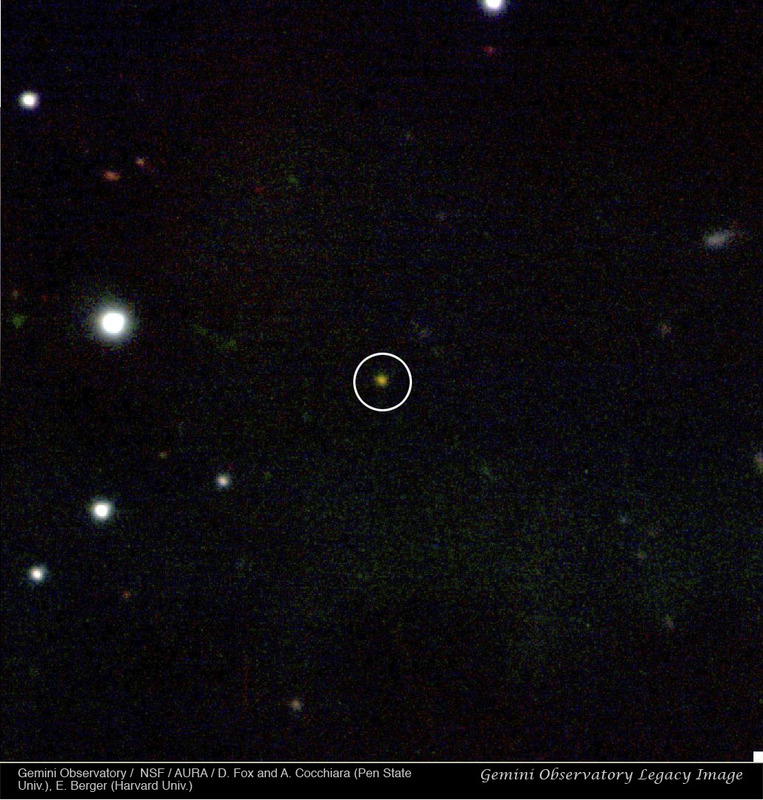 The new GRB 090423at a redshift of z=8.2 easily broke the previous record for gamma-raybursts, and also exceeds the highest redshift galaxy and quasar discoveredto date, making it the most distant known object in the Universe. GRB090423 exploded on the scene when the Universe was only 630 million yearsold, and its light has been travelling to us for over 13 billion years.Credit: Edo Berger (Harvard/CfA). The Gemini Observatory has released the first color image of what astronomers are calling the most distant object ever seen in the universe. The object is what is known as a Gamma-ray burst (GRB) which are the most energetic single events known in the universe. “Our infrared observations from Gemini immediately suggested that this was an unusually distant burst, these images were the smoking gun." said Edo Berger, a leader in the scientific team that made the discovery and professor at Harvard Smithsonian Center for Astrophysics. 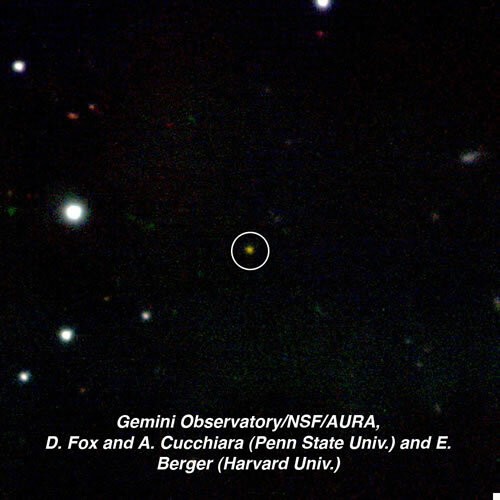 "The visible light was completely absorbed by hydrogen gas in the early universe, but the GRB was brightly glowing in the infrared images from Gemini." 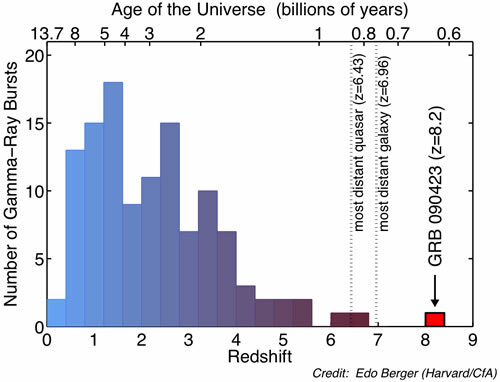 The burst as measured by Gemini and subsequent observations is at a redshift of z = 8.2, such a great distance that its light has been traveling for over 13 of the estimated 13.7 billion year age of the universe. “This makes it easily the most distant object ever seen by humanity, and takes us to a new frontier beyond redshift eight.” said Berger. In addition to the Gemini observations, the object was detected by the United Kingdom Infrared Telescope (UKIRT, also on Mauna Kea) early on the same evening as the Gemini imaging. The Gemini observations were made possible due to the extreme infrared sensitivity of the Gemini North telescope on Mauna Kea, Hawai‘i and a unique process of rapidly observing “targets of opportunity” immediately, before events like GRBs fade quickly from view. Going by the designation GRB 090423, the GRB was detected by NASA’s Swift satellite on April 23rd, 2009 at 3:55 a.m. EDT and was observed on the ground within minutes of its discovery. Gemini first attempted an observation in optical (visible) light and when the detection was negative, used the Gemini Near-infrared Imager/Spectrograph (NIRI) to make the observation in several infrared wavelengths. These images gave a relatively precise estimate for the object’s distance and were combined to make the color image released today. “I have been chasing gamma-ray bursts for a decade, trying to find such a spectacular event,” said Berger. “We now have the first direct proof that the young universe was teeming with exploding stars and newly-born black holes only a few hundred million years after the Big Bang,” he added. Gamma-ray bursts are the universe’s most luminous explosions. Most occur when massive stars run out of nuclear fuel. As their cores collapse into a black hole or neutron star, gas jets — driven by processes not fully understood — punch through the star and blast into space. There, they strike gas previously shed by the star and heat it, which generates short-lived afterglows in other wavelengths.